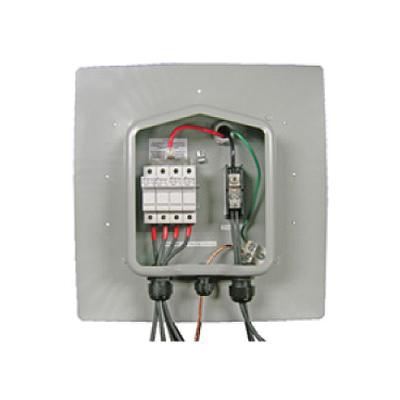 RSTC Enterprises Soladeck AC/DC Combiner enclosure operates at 120/240-Volt AC, 600-Volt DC voltage rating and 120/60-Amps current rating. It accommodates dual position ground 2/0 - 14-AWG conductors. It features seamless stamped 18-gauge galvanized steel construction and powder coated finish. It includes seven 1-Inch truss head screws, four 0.5-Inch 8-32 thread cutting screws, four bonded seal washers size 10, 6-Inch slotted din rail, two 10-32 1/2-Inch steel studs, two 10-32 3/8-Inch steel star nuts, one foam gasket seal and one installation manual. Combiner enclosure is UL listed, CSA certified and meets ETL standards.